Introduction -- What's It All About? The HPSDR is an open source (GNU type) hardware and software project intended as a "next generation" Software Defined Radio (SDR) for use by Radio Amateurs ("hams") and Short Wave Listeners (SWLs). It is being designed and developed by a group of SDR enthusiasts with representation from interested experimenters worldwide. The rationale behind the project is to break the overall design up into a number of modules. Each module is designed by an individual or group and connects to other modules using a pre-defined and common bus -- rather like plugging boards into a PC motherboard. This modular approach enables prospective users to incorporate just the modules that interest them as well as designing their own variants if desired. The approach also enables new ideas and circuits to be tested by replacing an existing module. Since the majority of modules will be retained, such experimentation can be done with minimum disruption to an existing working system. The modules vary in complexity from simple bandpass filters and input/output interfaces, to full blown DSP functions. Such variety enables experimenters with varying degrees of experience to contribute. Thus far, the modules have each been named for easier identification when talking or writing about them. On this website, each module has its own web page, as noted by the tab selections near the top of the page. Some of the modules are being designed so that they can be either used in conjunction with others or stand-alone. Each module board size (except the backplane) will be 100 mm. by 120 to 220 mm. and use either a 96 pin or 64 pin DIN41612 type connector. 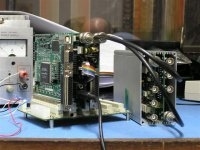 In order to provide a complete SDR, other modules will require developing. There is still much to be done in bringing HPSDR to fruition. For those experimentally minded Amateurs this may turn out to be the golden age of (software defined) radio! Please look at ht HPSDR history page to learn more on how we got to where we are today. The following block diagram is a listing of the main parts of a HPSDR system. Note that the diagram is clickable and will take to webpages on the listed components. Also note that there is a bold black line coming in which is the common +13.8v DC power and the blue line indicates the connection to the computer.